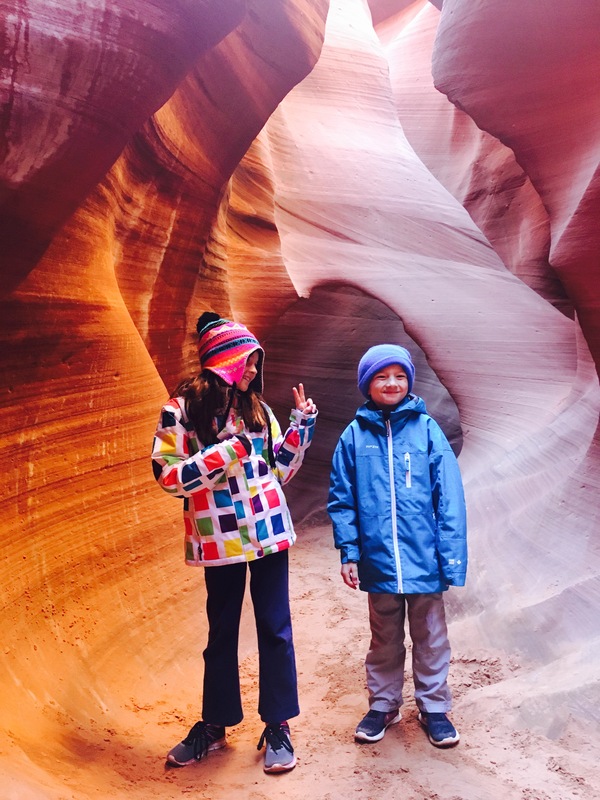 Antelope Canyon Experience – Neales…on wheels! 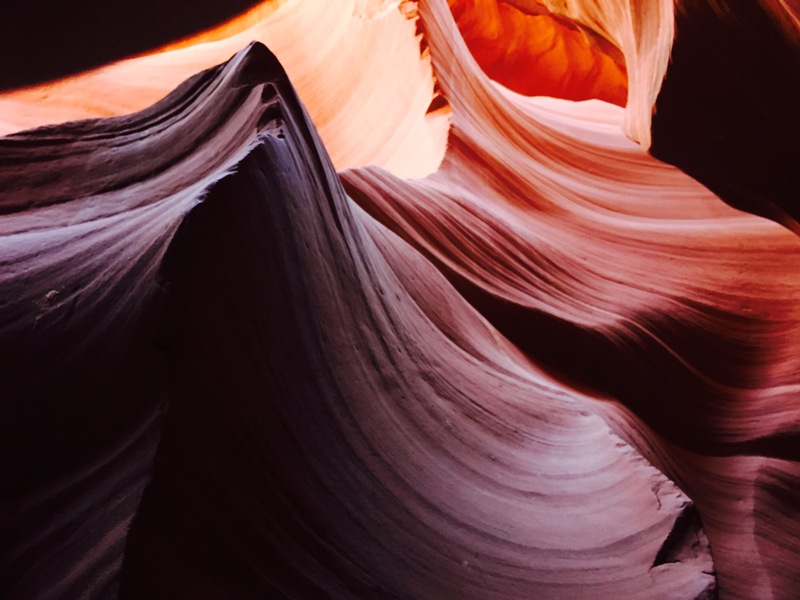 If you’re not familiar with the name Antelope Canyon, you’d most likely recognize it from fine art photographs or ubiquitous screensavers: canyon walls in improbable shapes, textures, and colors that look more like billowing fabric than solid rock. 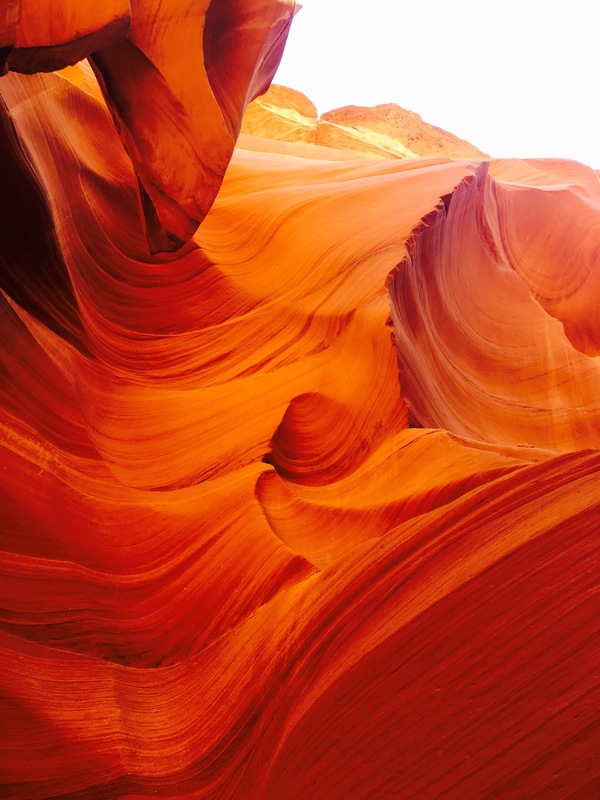 Antelope Canyon is a slot canyon formed out of Navajo Sandstone, located in the Navajo Nation and just outside the city of Page, Arizona. 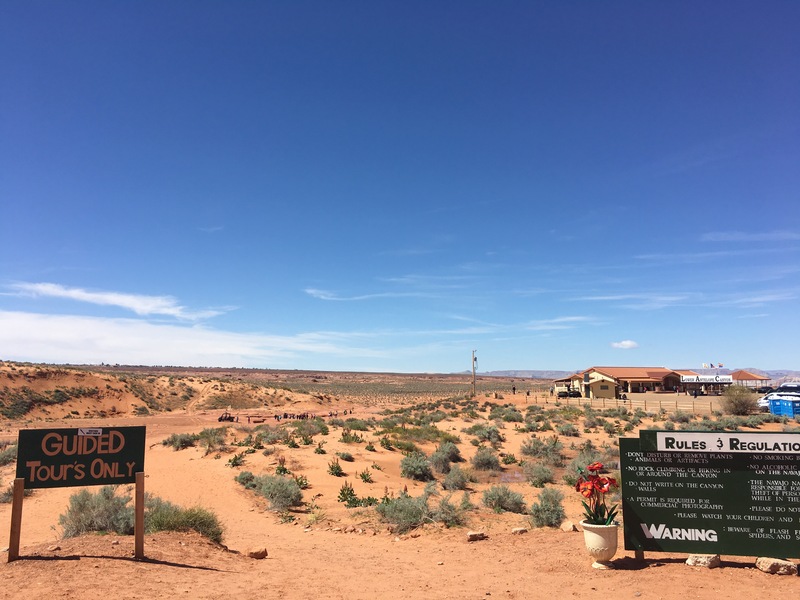 Page is a small town but a major tourist hub for its location on beautiful Lake Powell, with the Glen Canyon National Recreation Area and famous Horseshoe Bend of the Colorado River nearby. 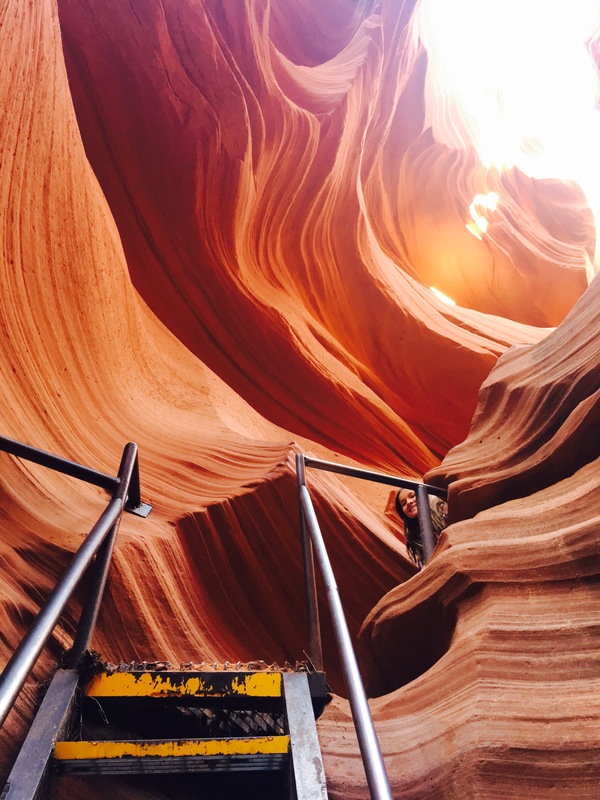 It’s also a gateway to the spectacular National Parks of Northern Arizona and Southern Utah, but many people come to Page from all over the world just to see Antelope Canyon. 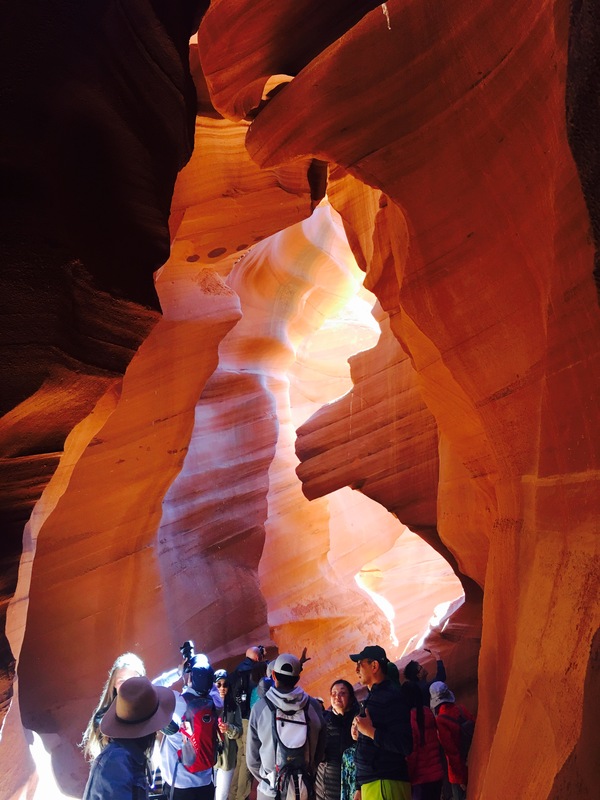 There are two separate sections that can be visited: Upper Antelope and Lower Antelope Canyon. 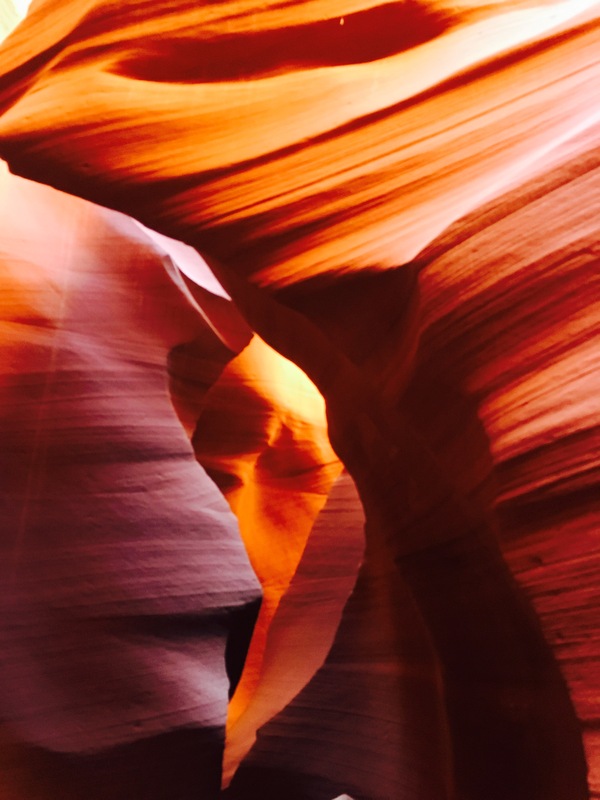 Upper Antelope was opened to guided tours first, is home to the most iconic images, and is therefore the most well known, i.e. crowded. Based on recommendations by people who have been to both, we opted for a tour of Lower Antelope. Since I haven’t been to Upper Antelope I can only compare based on what I’ve heard and read, but can confidently say that Lower Antelope exceeded my expectations and I would recommend it to anyone. It would be ideal to see both, but you are not missing out if you only visit Lower Antelope. 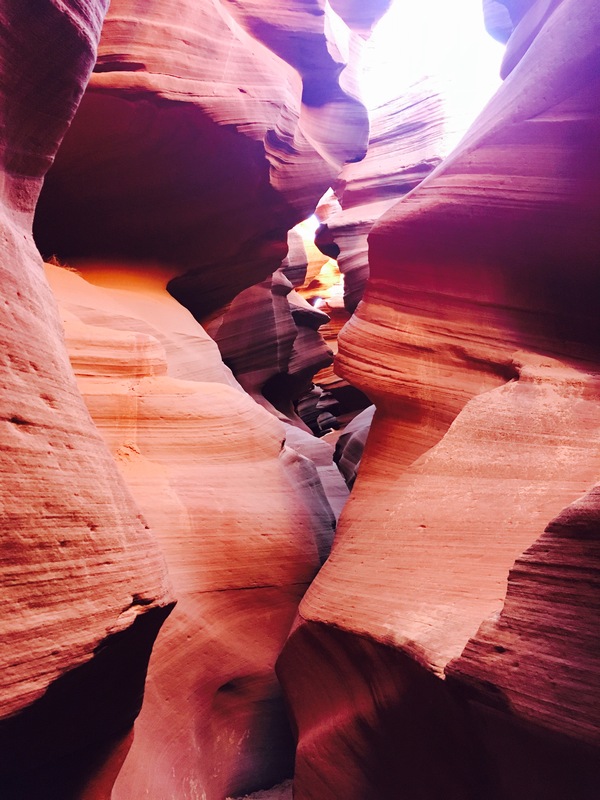 Upper Antelope is shaped like the letter “A” with a relatively spacious canyon floor allowing for amazing light and photography but also for more crowds. Lower Antelope is “V” shaped. While there are still plenty of people funneling through, we found that the narrow floor allowed for time (and photo ops) alone in the incredible space, if briefly. 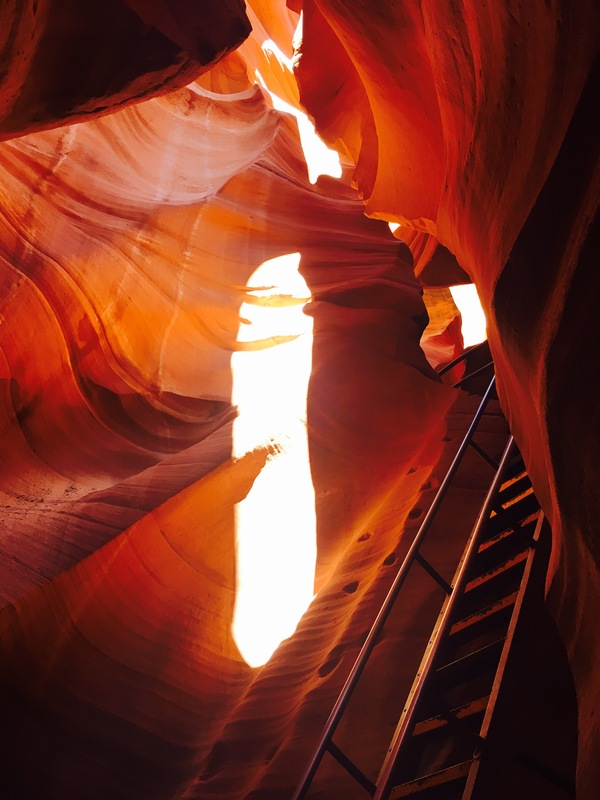 Upper Antelope is all one level, while Lower Antelope requires the ability to climb up and down a few steep ladders and stairs and through some narrow passageways. 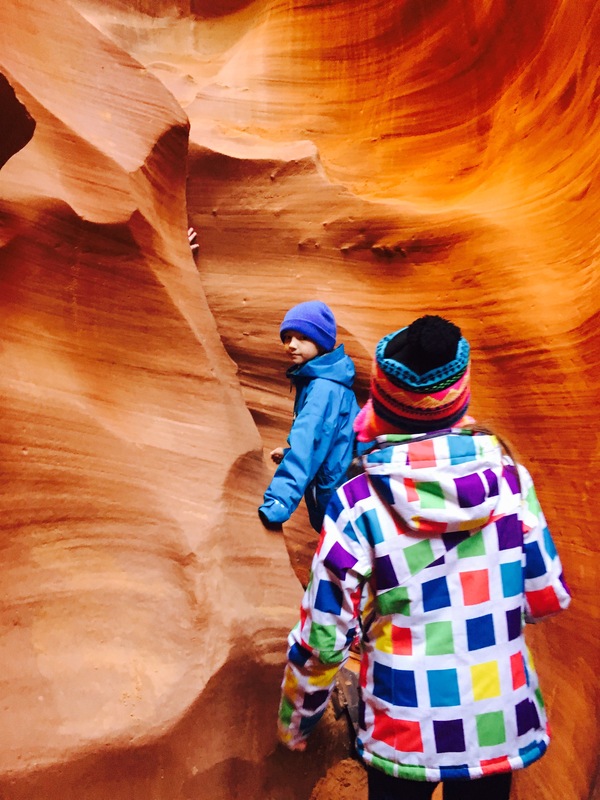 Whatever you choose, both canyons are only accessible by guided tour. 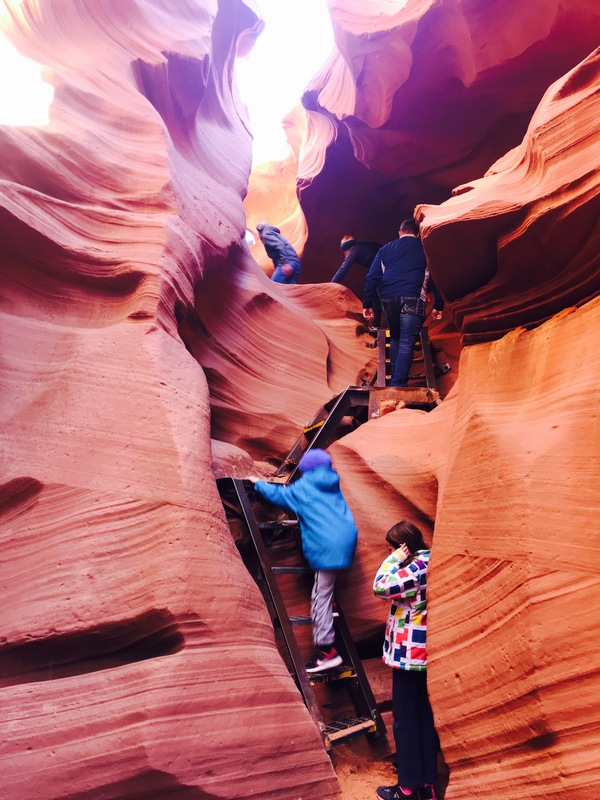 There are several companies that run tours for either Upper or Lower Antelope Canyon that are easy to find through an online search or brochures and ads displayed throughout Page. 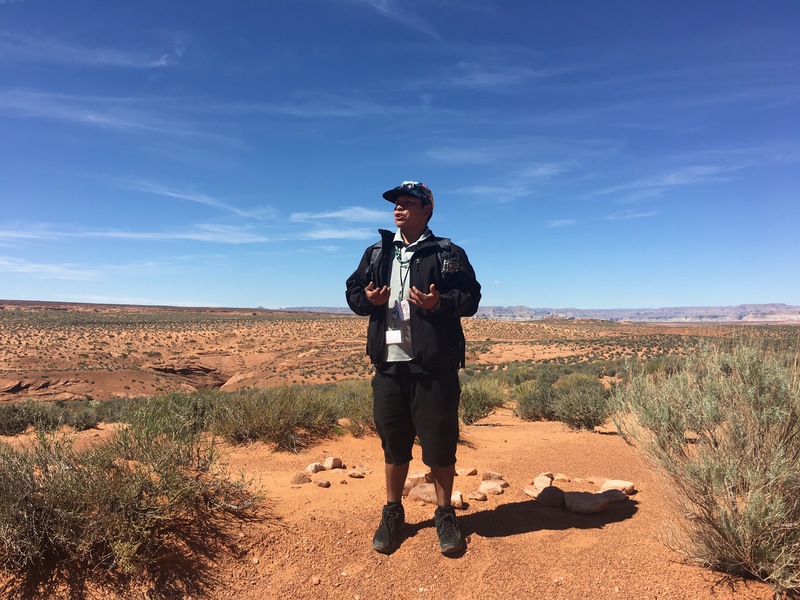 Be aware that there is an $8 per person Navajo Nation permit fee in addition to the cost of the tour; some companies include it in the tour price, otherwise it is payable in cash when you arrive. 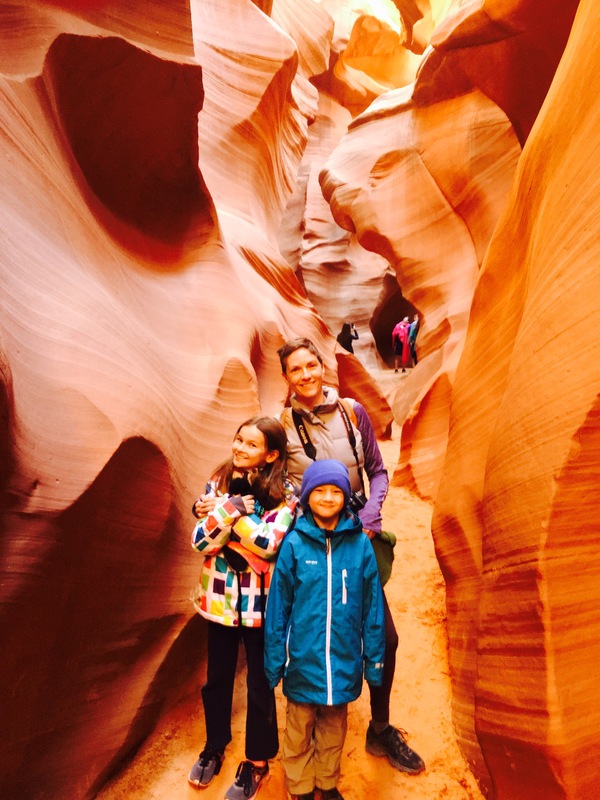 We booked with Dixie Ellis, one of the two Lower Antelope Canyon tour companies that are located adjacent to each other near the canyon entrance. Our guide, Arlondo was really great, and everyone else we encountered was friendly and professional. View from the Dixie Ellis departure point, with Ken’s Tours next door, and no hint of the canyon itself. 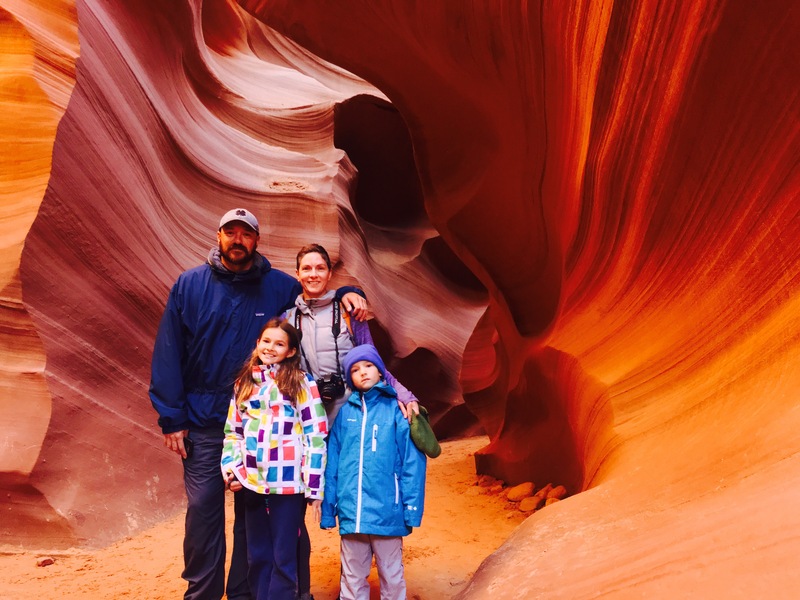 It’s best to make a reservation ahead of time – especially in the case of Upper Antelope, and as far in advance as possible during the busy summer season. You’ll have a better chance being accommodated as a walk-up at Lower Antelope. It’s also helpful to keep your options open in case there are weather cancellations or delays, as we found out. We booked the first tour at 8:10am on Tuesday, but because it rained all day Monday the departures were delayed by a couple hours. 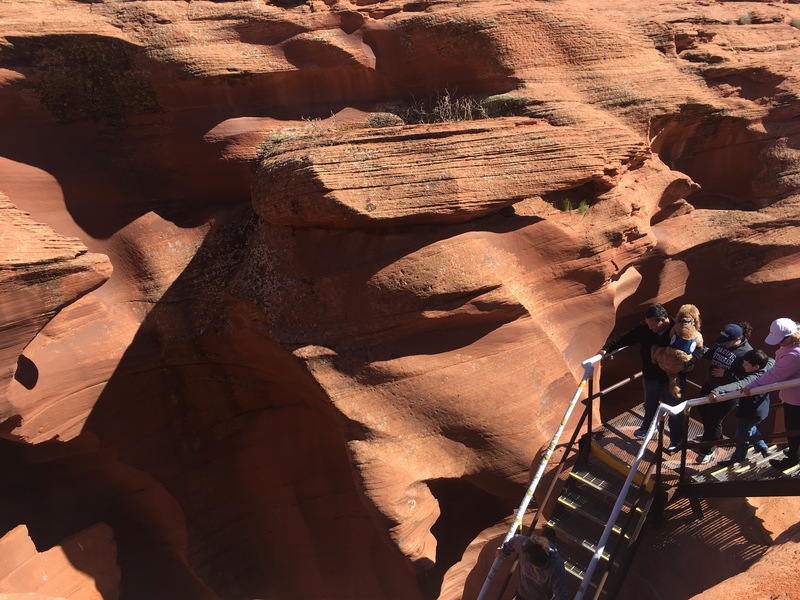 The staff couldn’t tell us when exactly the tours would start – understandably, as the guides from both companies were busy sweeping sand and water out of the canyon. We didn’t re-book but were told to just come back later in the afternoon. We showed up at 1:30 and, even though the parking lot looked alarmingly full, had no problem getting on a 1:50 tour. The tours depart every 20 minutes, which is accurate but a bit misleading. Each guide leaves from the office frequently with a small group of about 10 people, and our tour started with an interesting walk and talk about the geology and history of the area. But we soon caught up with a bunch of other groups outside the entrance to the canyon. 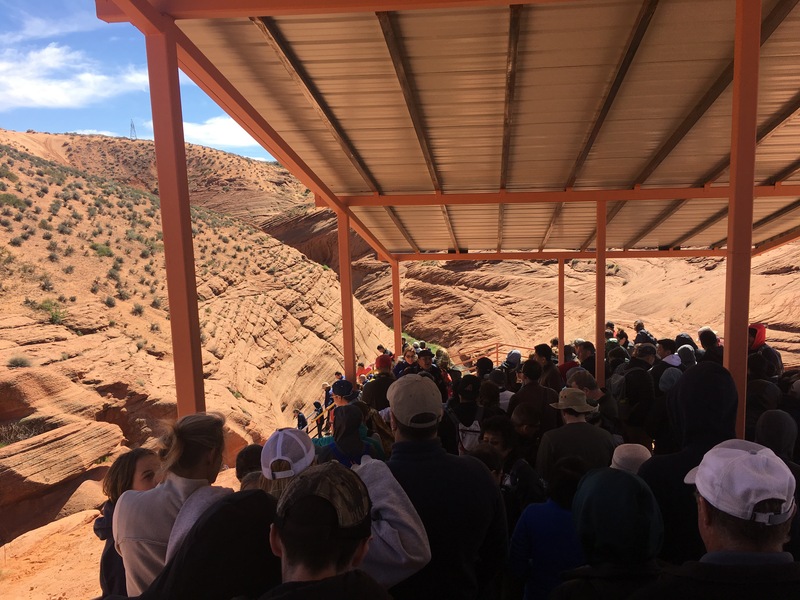 I was a little concerned when we saw the crowd waiting to descend the single-file staircase to the canyon floor, and we were there for almost an hour. 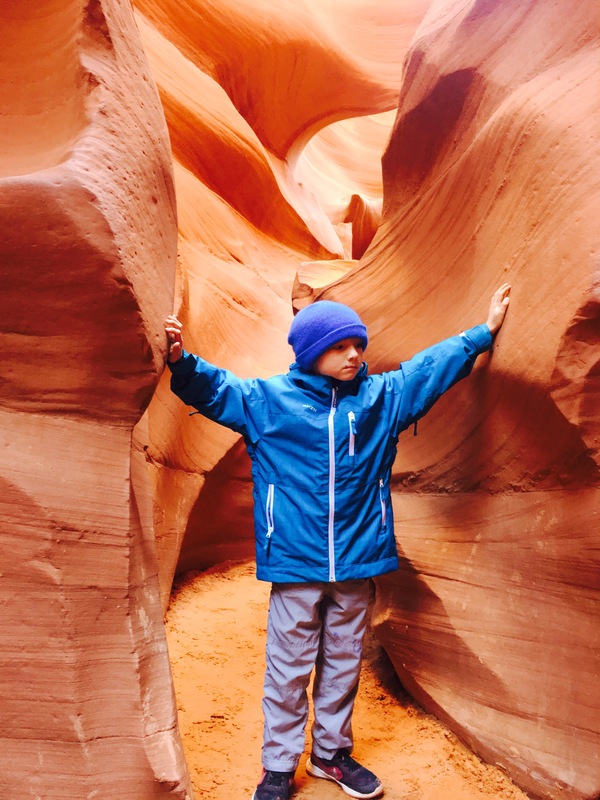 Arlondo kept us engaged with historical and personal stories about the Navajos and Antelope Canyon – with frequent interruptions to remind other guests to stay away from the canyon edge (It’s not only kids who don’t listen). My advice going into this is to expect to wait at least an hour before entering the canyon, unless you get on one of the first tours. Bring water, a hat, charged cellphone, and something to keep the kids occupied because they can’t just wander off and play on the rocks. I’d also say don’t be put off by the crowds, because it’s worth the wait. The first descent. Note the man at the top of the stairs holding a dog – don’t plan on bringing yours, unless it is a service animal. After descending the first set of steep stairs, it was pretty exciting to be down on the canyon floor and start to see the awesome formations. Because the passage is so narrow and twisty our small group was mainly by ourselves, with the occasional overlap with the people in front or behind us. I think the guides do a great job of making the experience special for their small groups, while also keeping everyone moving on from the irresistible photo ops at each and every turn. Arlondo suggested the best camera filters to use on our phones, and offered to take shots from specific angles that he knew had the best effect. Note: tripods are not allowed on the general tours, but specialized tours are offered at both canyons and can be worth the extra cost if you are looking for a serious photography experience. All photos here were shot on my iPhone 7, most using the Chrome setting (thanks, Arlondo). After this crowd right at the canyon entrance, where everyone starts snapping pictures, our small group was mostly all on our own. Lots of tight turns like this one. Lower Antelope is about a quarter mile long (Upper is 600 feet), but we spent almost a full hour in there, and by the time we climbed out the narrow passage exit I had the disorienting feeling that we were emerging on top of a mountain, not back up to ground level. The impressions from being in this other-worldly, stunningly beautiful natural wonder stuck with me the rest of the day. Climbing out back to the real world. Rita at the very narrow exit. It’s hard to believe that amazing canyon is under there. I’d love to hear from anyone who has been to either Canyon, and how your experience compares! Stunning photographs! I would love to see this place. Also, I never thought about it but your description of it looking like billowy fabric is spot on. I am enjoying all your travels, photos and descriptions. Thanks so much, Kathy! Having worked for an inbound tour company I knew how popular it was and was almost put off by the thought of the crowds, but I’m so glad we went! Your photographs are truly magnificent, Michelle. I cannot view them without grieving for our dear friend David Brower whose unsuccessful struggle to block Glen Canyon Dam led to the flooding of an area equally beautiful but helped galvanize the modern environmental movement. Wes and I visit the tree we planted on our little campus with David to regularly to refresh our personal commitment to his philosophy for the Earth. https://en.m.wikipedia.org/wiki/David_Brower. Thank you, Leslie. I can only imagine how heartbreaking it would have been to witness. It’s still pretty shocking to realize that this Lake is really a flooded canyon, especially when seeing places like Zion and the Grand Canyon and of course Antelope. Thanks for sharing. 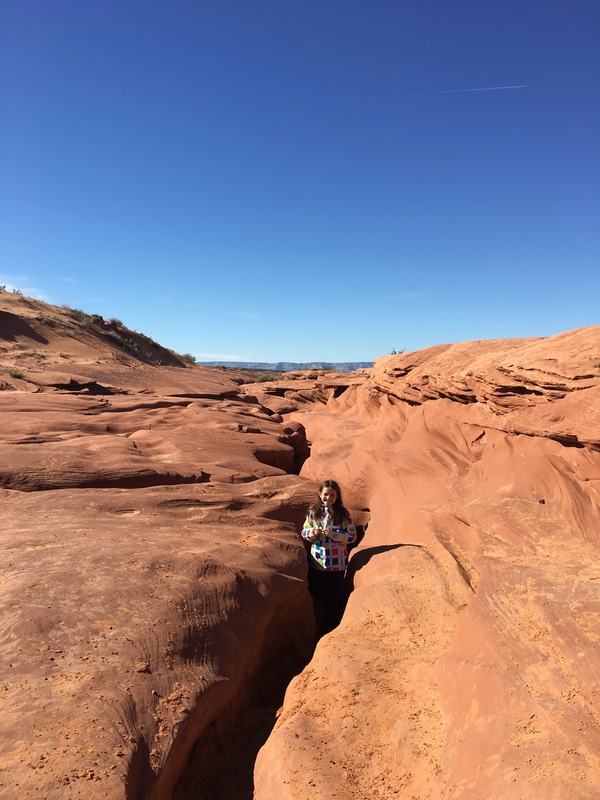 Pingback: Kanab, Lake Powell, and the Mystery of Time – Neales…on wheels!